Inspired Whims: Give-away closed. Winner announced! 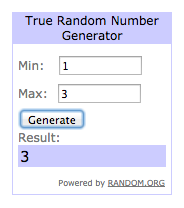 Well friends, the 3C Cards give-away has now closed and I selected a winner at random thanks to random.org. Here's the screenshot of the winner...drumroll please. That means Laurie will be receiving her 3D cards in the mail soon. Thanks to both you ladies for playing and reading Inspired Whims! Have a happy week.